Simple Bathroom Designs are not always easy to get right. In this article, we are going to look at 5 simple tips that you can implement to get the best results. Often bespoke bespoke bathroom design and installation and designs are done in one of two ways; grand marble flooring with so much unnecessary space a medium sized pool could be dug in, or on the more usual contrary, most people seem to have an awkward sized and shaped bathroom. Usually, there is no happy medium. More than often we are stuck with a small bathroom with a strange boxed geometric wall. While this is an admirable attempt to cover up unsightly pipes, it does cost space and practicality. Keeping to simple bathroom designs helps make the most of the space you have available and if done well, can add a sense of openness. Remodelling a small bathroom is a challenging yet rewarding task. Whether you are adding a touch of colour or having an underfloor heating installation there are many considerations. Depending on how you look at the whole renovation process. For the most part, it may feel impossible to redesign your odd and dull bathroom. However, these top tips can be applied to any bathroom makeovers to turn the ugly into luxury. There is a forever changing bathroom design trends that seem to go out of fashion not long after a remodel. Not only does this take away the appreciation of a beautiful bathroom installation, but it also makes it harder to choose the best colour palette. With this in mind, a simple yet elegant neutral white colour pallet allows room for future easy changes. In choosing such a basic colour it ensure you can tweak the design at a far cheaper cost. For instance if you feel white is too plain, you can add bursts of colour through displaying bright towels and coloured toothbrush pots. Then all it would cost is a quick swap of decorations to upgrade your existing beautiful bathroom. Additionally, you could opt for a bold accent wall or floor. While sticking to a neutral colour pallet base, you can still bring a more unique but not overpowering addition. As mentioned, this sleek bathroom remodel is a great example of a bold accent wall. Keeping a neutral base and adding a deep warming red to entice luxury and elegance in. If a red bathroom isn’t for you, why not try calming blue hues or a refreshing green. Whichever colour you chose on should reflect an emotion you want to feel when you enter your shower. Giving your bathroom a colour tailored to your taste will boost its personality. Mirrors are a great way to make small bathrooms feel more spacious. Obviously, we all know mirrors can be expensive. Especially if you want a good quality mirror. If you have a look in a charity shop, or in your loft, you’re more than likely going to come across a high-quality mirror. Whether it is an old one of yours or a cheap used mirror, you can save plenty of money. Update the old mirror by repainting the frame. Doing so will also allow you the freedom to add your own unique, one of a kind piece to your new bathroom design. Ultimately they are the most useful and easy way to reflect light through the bathroom. A simple bathroom design tip is to spend a bit of money making your shower look a little more luxury. A new shower head being fitted can be an affordable upgrade that makes a huge difference. For a touch of extra class and a modern finish, consider a rainfall shower head. This will help take you from a standard shower to a boutique luxury hotel feel. If you’ve made the choice to upgrade the shower head, why wouldn’t you want to show it off? Beautiful glass shower doors can transform a bathroom and make a huge difference to the look and feel of your room. 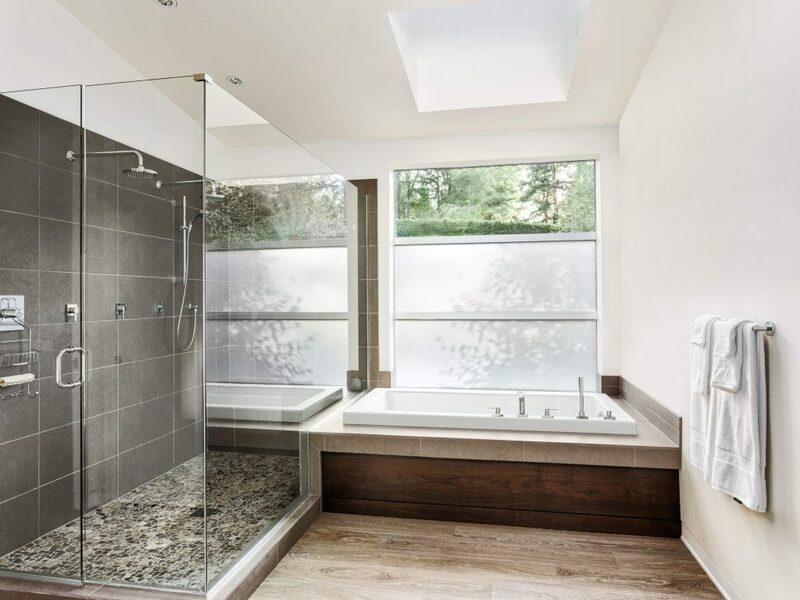 While some may love the idea of a glass shower door, it may not be practical for others. If for instance, you have a roommate that walks in to brush their teeth, oblivious to your presence, a glass door is not an option. Luckily enough we have an answer for this – frosted glass. It allows light to pass through and still gives your bathroom an open spacious feel. In addition to this, it can be used on windows. Which is also very useful for people who do not want any blinds in their bathroom. If after reading this you find you are full of inspiration and great ideas and are motivated to get your bathroom looking great again but don’t know where to start with a Bathroom Installation give Turner Plumbing Services a call on 07957 512412.